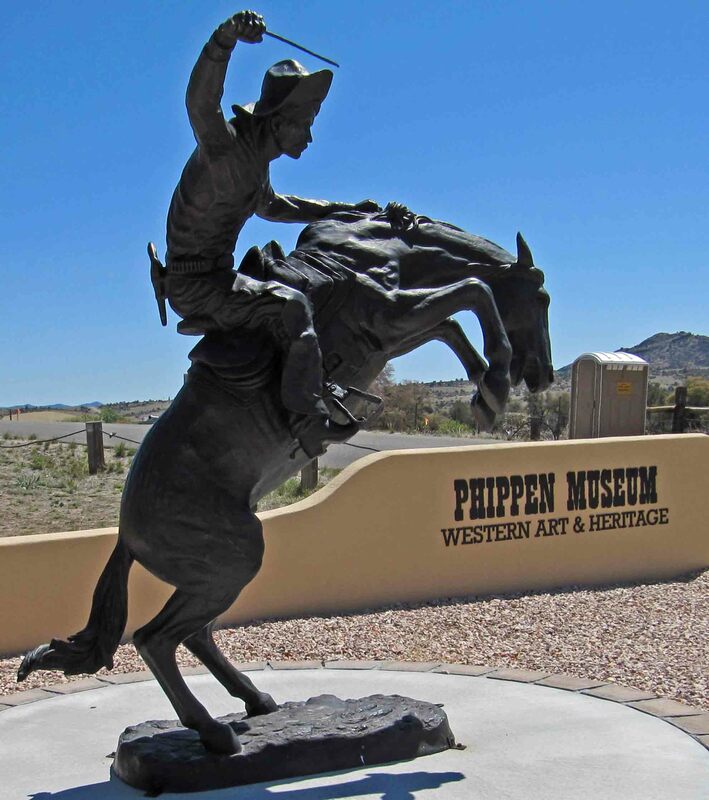 The Phippen Museum, named after George Phippen, the founding President of the Cowboy Artists of America, is committed “to preserve and exhibit museum quality Western art and educate the public about the unique heritage, history, legends and influence of art of the American West.” The main gallery includes several pieces by George Pippen. Of special interest are the small bronze sculptures located throughout this Prescott, Arizona museum which opened in 1984 and is making plans to expand. The current special exhibit, All Aboard! The Life & Work of Marjorie Reed, features some of her 82 paintings documenting the Butterfield Overland Trail. She traveled along this mail route in the 1930s and 40s and completed this series in 1957. She paints stagecoaches racing along the wild landscape in the early days of settling the West. With several husbands, her personal life was as colorful as her artwork. South Mountain is alive with color. 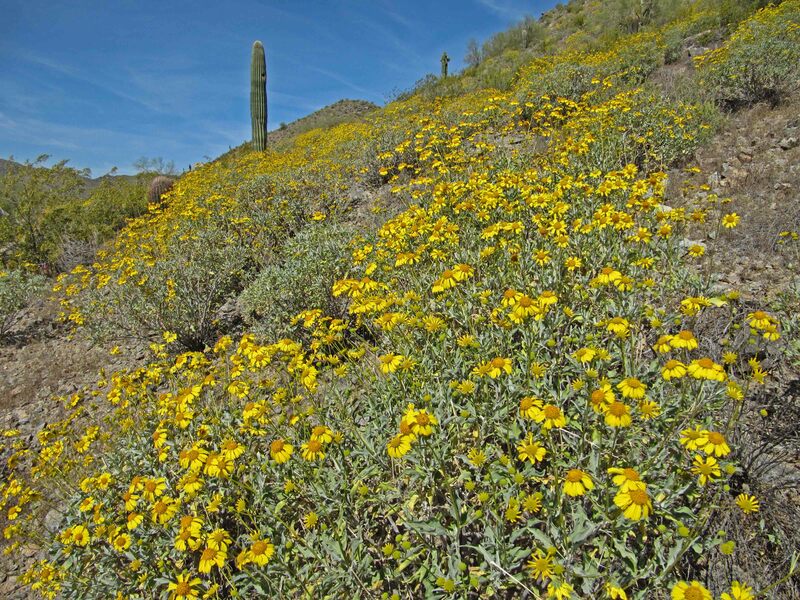 A short hike from The Pointe South Mountain Resort along the ridge overlooking the Phantom Horse golf course immersed us in a sea of yellow brittlebush blooms. The five star petal of the creosote bush is also yellow. Magenta colored strawberry hedgehogs dotted the hillside, too. A gilded flicker pecked at a stately saguaro. A fine outing under another stellar blue sky day. A week later we extended our hike in this area by walking to the 48th Street parking lot and attempting to find the Marcos de Niza rock etching said to be from 1539. We got sidetracked on the Desert Classic Trail, backtracking after climbing three or four vistas. The flowers on the creosote bush were past their peak, forming a fuzzy white globe shaped seedpod. In addition to the predominant yellow flowered brittlebush, there were at least three blue colored wildflowers: perhaps a wild heliotrope, chia, and a small orchid-like purple flower yet to be identified. There was also an orange desert globemallow. In addition to the strawberry hedgehogs, red tubular ocotillos were in bloom, and the tops of some saguaros were budding. Although Ludwig Van Beethoven’s Symphony No. 8 in F Major, op. 93 was the featured work concluding the Phoenix Symphony’s Beethoven Festival, two other Beethoven works selected for Saturday evening’s concert merit mention. Conductor Michael Christie picked several movements from Beethoven’s ballet The Creatures of Prometheus, op. 43. According to the Greek myth, Prometheus created humans sparking them to life with intellect and understanding. This storyline provided Beethoven with the context to focus on his ideals for human freedom, choice and enlightenment. Solos from cello, harp, flutes, and oboes displayed the lyrical quality of this work. “Lenore” Overture No. 2, op. 72a is from Beethoven’s only opera. Based on the story of a man wrongfully imprisoned, Beethoven expresses his belief in freedom from political oppression and the power of love. As a former viola player (without talent), I especially enjoyed Michael Christie’s intermission dialogue with principal violist Mark Deatherage. It was interesting to hear his perspective on different styles of bowing for this instrument that sometimes sounds like a violin and at other times a cello. Another wonderful evening of music. 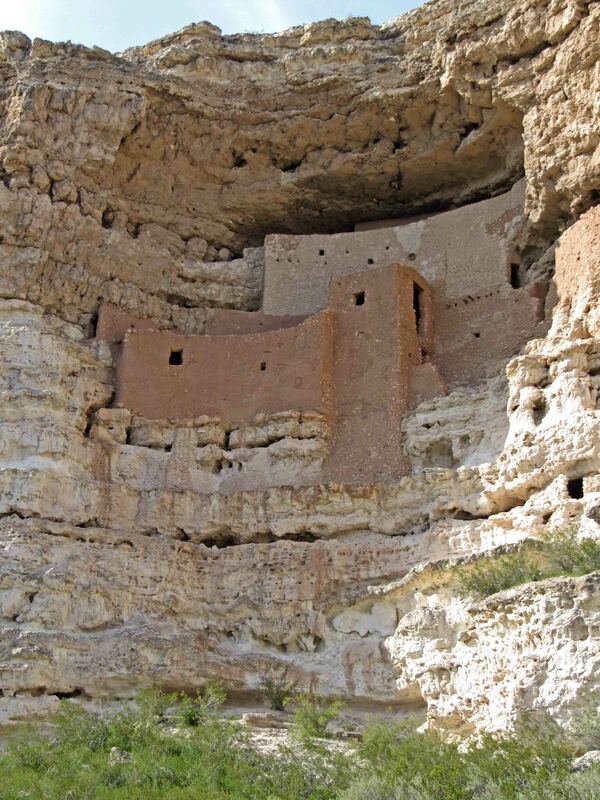 The misnamed Montezuma Castle, a five-story 20 room dwelling, was the comfortable home of Southern Sinagua from about 1100-1400. Close by, built against the base of the cliff, was a six-story dwelling with 45 rooms with extensive deterioration from treasure seekers. Although not of Aztec origin, the farmers who lived here selected a protected location with a nearby source of water. A special thank you to Teddy Roosevelt for using an executive order and the Antiquities Act to make this unique site a National Monument. Located about 11 miles away is Montezuma Well, a natural sinkhole 368 feet wide with cliffs rising 70 feet above the water’s surface. Fed by underwater vents, some 1.5 million gallons of warm water flows in the Well each day. The water exits through a 300 foot cave and emerges where the people of the Sinagua culture constructed an irrigation ditch. A short trail allows views of the cliff and cave dwellings, pueblo ruins and irrigation ditch along Beaver Creek. The unanswered question is why these settlements were abandoned. Was it disease, over-population, depletion of natural resources or failure of crops, conflicts within and between groups, changes in weather patterns such as drought, or perhaps something related to their spiritual beliefs? The Highlands Center for Natural History and the Prescott Audubon Society launched their 2nd Annual Birding Spree this past Saturday. More than 60 people of all ages showed up at 8 a.m. for the first guided walk. Eric Moore, owner of Jay’s Bird Barn, led our contingent of 20 for a walk on some of the trails around the Highland Center. We identified the following birds: acorn woodpecker, American robin, Anna’s hummingbird, bridled titmouse, bushtit, common raven, dark eyed junco, hairy woodpecker, house finch, lesser goldfinch, Lucy’s warbler, mourning dove, pygmy nuthatch, red-naped sapsucker, ruby kinglet, turkey vulture, western bluebird, white-breasted nuthatch. It was wonderful to have an experienced birder identify birds by sight and sound.